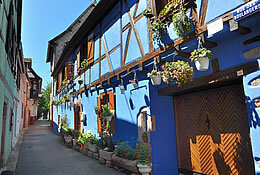 In the beautiful medieval village of Ribeauville, Marie-Pia Kern welcomes you to her charming guest house. 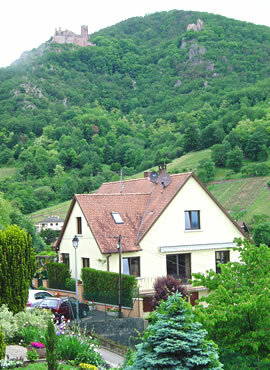 You can choose between a fully equipped vacation rental for 2 people, rated 3 Stars (Gites de France) and a bed & breakfast (2 stars Gites of France). 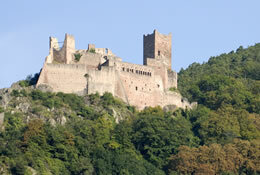 The shaded garden overlooks the hills and vineyards, dominated by the ruins of the 3 castles of Ribeauvillé: St. Ulrich Castle, Giersberg Castle and Haut-Ribeaupierre Castle. The guest house is located in a quiet area, 10-minute walk from downtown and shopping. The main cities of Alsace are all nearby and you can visit them on day trips: Sélestat (13 km), Colmar (15 km), Strasbourg (55 km) and Mulhouse (60km).